We’re in the midst of a deep, passionate love affair with the city of Annapolis. Maryland’s capital city is also one of the most charming waterfront communities in the United States. It is everything you could ask for: beautiful, historic, and incredibly fun to visit. For years we’ve been coming and have always looked at the red-brick hotel right on the waterfront with longing. Now we know what makes the Annapolis Waterfront Hotel so special. When coming to Annapolis, we (or any visitor) want to be in the midst of the action. We want to see the boats and smell the water. 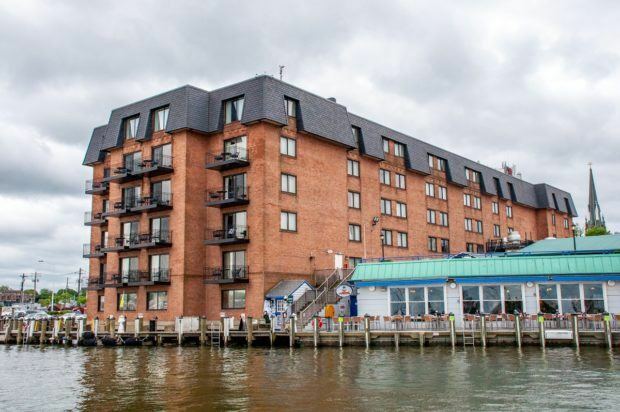 We want to hear the “chug chug” of boats as they cruise up “ego alley.” And that is the first thing anyone notices about the Annapolis Waterfront Hotel. However, once you get past the cool waterfront location, other things strike you about the hotel. There are the constant smiles on the faces of the employees. The nautical themed wall coverings and ship models in the lobby aren’t just decorations – they were actual maps and training tools for sailors. And there’s the table with a single candle and an empty chair to pay respect for our sailors lost at sea. In all of the little details, the Annapolis Waterfront Hotel proves why it is a distinguished Autograph Collection property. So, when it comes to the best hotels in Annapolis, the Waterfront Hotel is at the top of the list. It’s the perfect place to explore they city. With so many great things to do in Annapolis, you won’t lack for any excitement. This city just calls to us. It’s probably why we keep returning again and again and again. 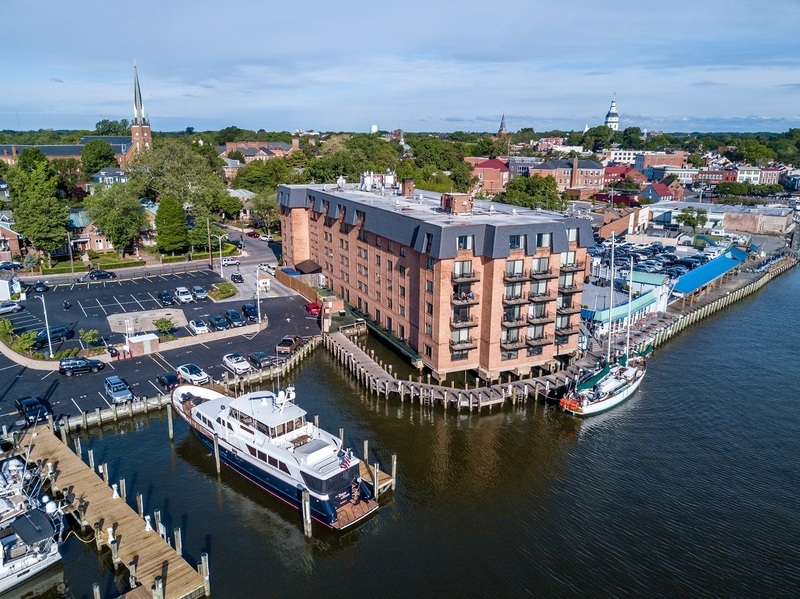 The Hotel: The Annapolis Waterfront Hotel occupies prime waterfront real estate in the heart of Annapolis. 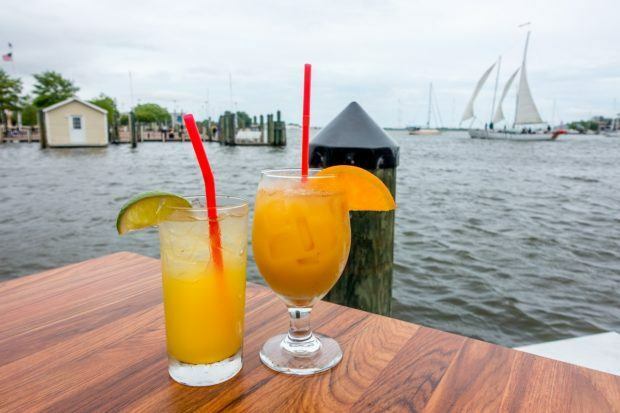 It is the only waterfront hotel in the city, making it one of the best hotels in Annapolis, and is located at the entrance to “ego alley” immediately opposite the U.S. Naval Academy. Nearly all rooms in the hotel offer a view of the water. It’s also worth noting that the Schooner Woodwind, which offers popular sailing cruises and even the chance to participate in sailing races, docks right at the hotel. The Restaurant: The hotel is home to Pusser’s Caribbean Grille. Travelers may recognize Pusser’s as the same legendary beach bar from the Virgin Islands. It is also the only Annapolis waterfront restaurant actually in downtown (there are a couple of waterfront restaurants in East Port). When it comes to dining in Annapolis, Pusser’s runs with the best. On our trip, we nibbled on Crab Balls and the Maryland Crab Dip. 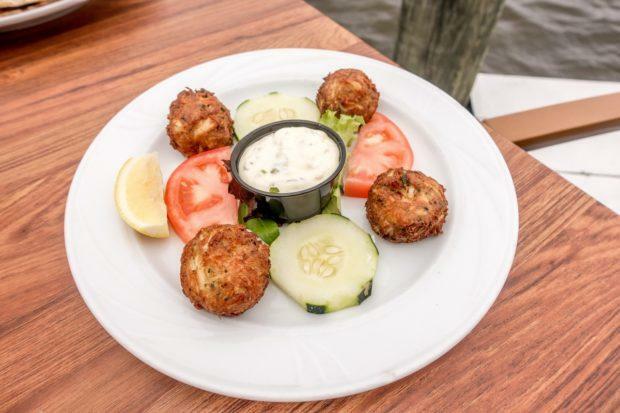 In Maryland (and in Annapolis), it’s all about the crab cuisine, so be sure to try at least one crab dish at Pusser’s. The Bar: The bar at Pusser’s is a lively spot for a late-night cocktail. More often than not, guests will spill out onto the landing to enjoy their beverages by the water. 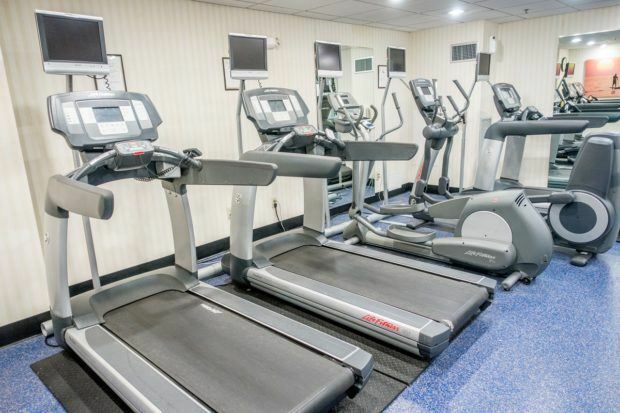 The Spa and Recreational Facilities: The Annapolis Waterfront Hotel has a small, but fully furnished fitness center on the top floor. Guests can hit the treadmill or use the weight machine to work out. The Rooms: The rooms at the Annapolis Waterfront Hotel are all decorated in what we would call “nautical chique.” The rooms are themed, but not kitschy. 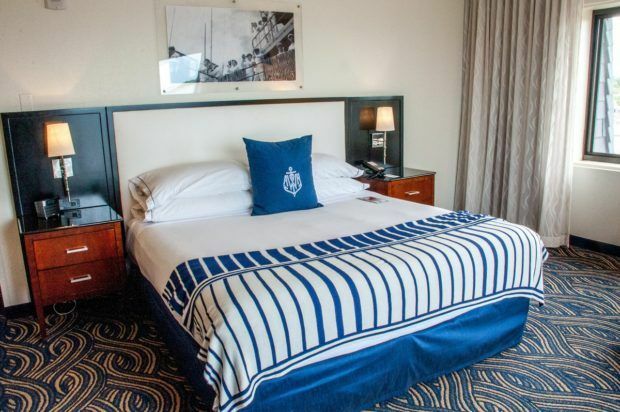 All rooms are decorated in the classic, nautical blue and white rope trim with throw pillows that feature the hotel’s logo. As a bonus, the giant windows offer a fantastic view of the harbor. Most of the rooms in the hotel have been recently remodeled, and all the care and detail that has been put into them shows! We’re light sleepers. Our room overlooked the water and the bar. At one point, we looked out the window of our room and could see several hundred people drinking, dancing, and partying on the dock immediately below our window with a live band playing. And we couldn’t hear any of it. Needless to say, we slept like babies. The Bed: The large king bed is one of the most comfortable hotel beds we’ve had in a long, long time. The WiFi: The hotel has excellent free wifi throughout the entire property. The Television: The room had a large flat panel TV, which was positioned atop the desk. The Safe: The room has a safe for valuables. 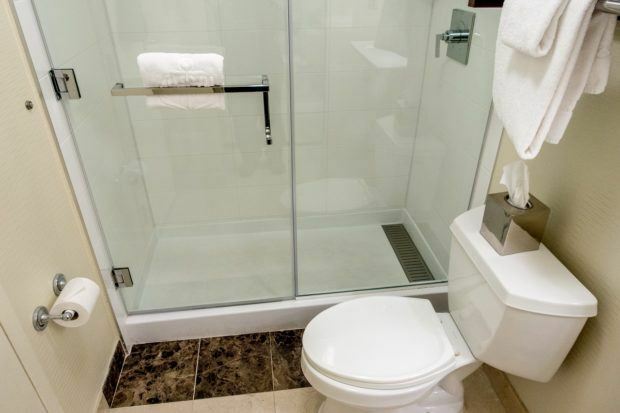 The Bathroom: The bathroom is a standard hotel bathroom with sink, shower and toilet. Rooms are also available that have shower/tub combination, which is available on request. The Cost: Room packages at the Annapolis Waterfront Hotel start at $289 for a city view room and breakfast. Waterfront rooms are more. 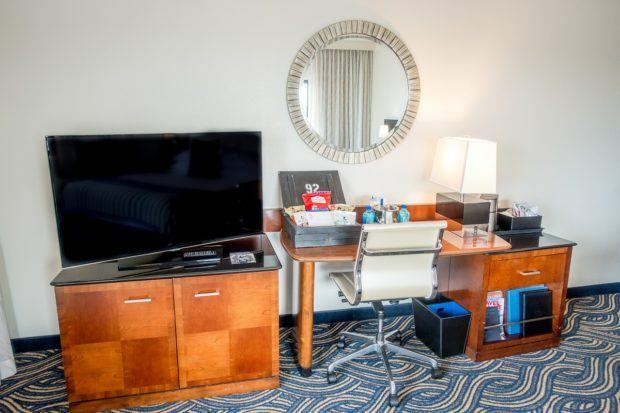 The hotel offers a number of package deals that offer remarkably good value including walking tours, harbor cruises and even dinner at the officer’s club at the U.S. Naval Academy. 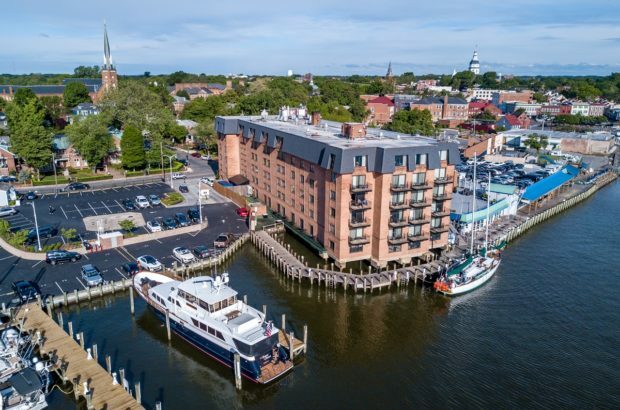 The Location: Of all the Downtown Annapolis hotels, only the Annapolis Waterfront Hotel is actually on the water – literally. 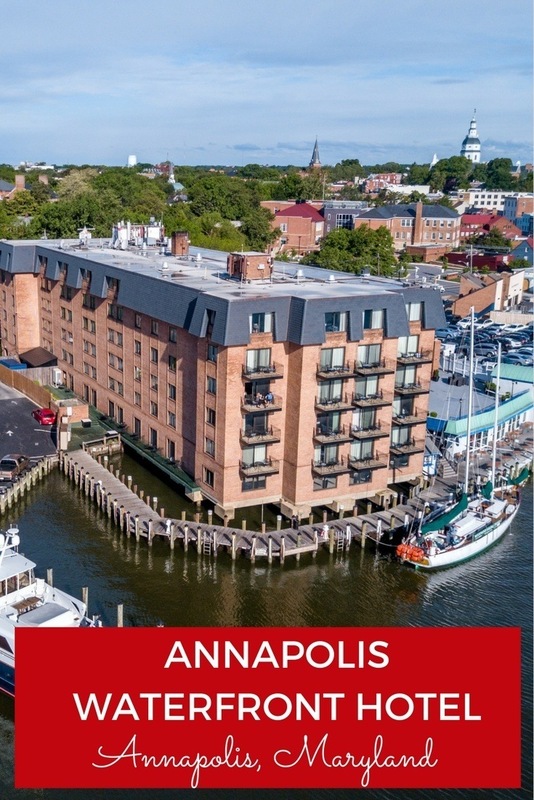 It is located in the heart of downtown on Compromise Street (the road that connects Annapolis to East Port) and next to the Annapolis Yacht Club. The Transportation: The hotel is best reached on foot from anywhere in Annapolis, via water taxi (which stops at the dock outside the hotel) or private vehicle. The hotel is valet only, which costs $25 per night. 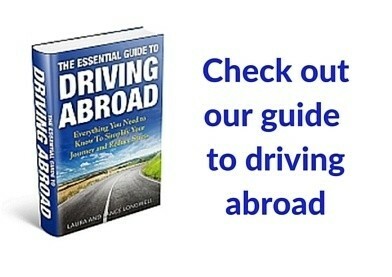 The Airport Transfer: The nearest airport is Baltimore/Washington International Thurgood Marshall Airport (BWI), which 24 miles from the hotel. 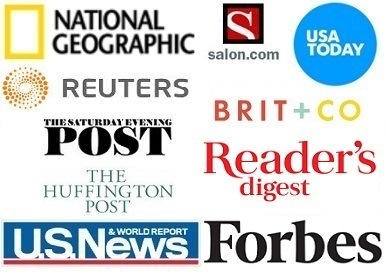 Also in regional proximity are Ronald Reagan Washington National Airport (DCA), which is 36 miles from the hotel, and also Washington Dulles International Airport (IAD), which is 62 miles away. We were the guests of the Annapolis Waterfront Hotel. All opinions of the nautical and the exceptional are our own. 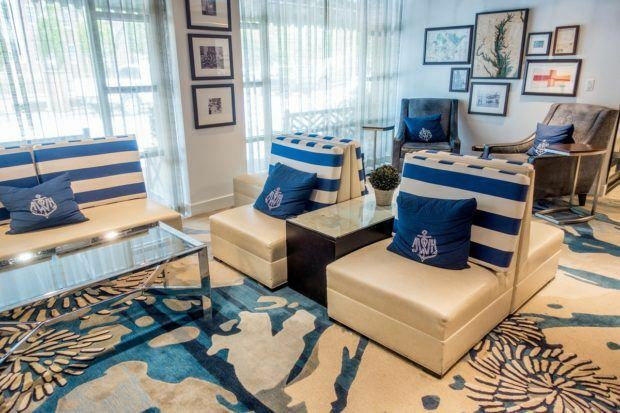 What do you think about The Nautical Appeal of the Annapolis Waterfront Hotel?